Wintertime is the perfect time to try your hand at cold-smoking; you should have no trouble maintaining temperatures below 90 degrees in your smoker or grill, especially if you live in a northern state. If you’re a southerner—Steven, for example, lives in Miami where it’s routinely hot, even in January—we’ll share our tips and tricks for cooling things down. Civilization’s relationship with cheese predates recorded history, but there’s evidence that cheese has been around for at least 7,200 years. How did mankind discover smoked cheese? Perhaps the meeting of wood smoke and curdled milk was accidental. Or perhaps our ancestors, having discovered wood smoke was a natural preservative, sought to add shelf-life to a very perishable product. In any case, the story’s been lost. What hasn’t been lost is the appeal of smoked cheese. It commands high prices in specialty markets and gourmet stores. The cheese: You can certainly splurge on premium cheeses, such as artisanal mozzarella, farmhouse cheddar, halloumi, Manchego, Greek feta, imported gouda, etc. But even supermarket cheeses respond beautifully to cold-smoking. Avoid softer cheeses with a low melting point or cheeses with a prominent natural or wax rind (you can remove the wax before smoking, however) as rinds impede the absorption of smoke. If desired, you can cut the cheese into smaller blocks or wedges. The fuel: You will, of course, need a steady supply of smoke. There are several ways to accomplish this. Sawdust: A tin pie plate loaded with sawdust can smolder for quite some time—long enough to smoke cheese, at any rate. Just make sure the sawdust doesn’t burst into flame. Get it started using an electric hot plate, a match, or a small kitchen or workshop torch. Replenish as necessary. 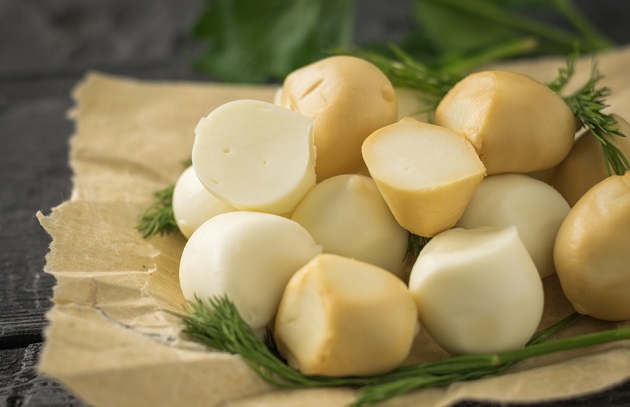 Straw or hay: Long ago, Italians discovered the joys of smoked cheeses like scamorza affumicata, a pear-shaped mozzarella-like cheese perfumed with a short (15 minutes) exposure to smoke from straw or hay. (Actually, nearly all the food cultures on Planet Barbecue have their own versions of smoked cheeses.) For something similar, try Steven’s recipe for Hay-Smoked Mozzarella. Handheld smoker: At Barbecue University and on Steven’s TV shows, we have successfully smoked delicate fresh cheeses, such as fresh ricotta, using a handheld smoker like the Smoking Gun. (It has many uses.). -Make sure the cheese is well-chilled before you begin. We do not recommend freezing it first as freezing can affect the texture. -Maximize surface area and exposure to smoke by cutting bricks or wheels of cheese into wedges. -While we encourage you to experiment with different flavors of wood chips, sawdust, or pellets, we recommend starting with milder woods like apple, cherry, and maple. -Do not let the temperature in the smoke chamber rise above 90 degrees. And do not let the fuel burst into flame. -To make the cheese easier to handle and for more attractive markings on the finished product, arrange it on a small mesh grid before placing on the grill grate. -If smoking different kinds of cheeses, identify them with toothpicks (i.e., one = Swiss; two = Monterey Jack; etc.). -As always, make sure the grate on your grill or smoker is scrupulously clean before allowing it to come in contact with the cheese. You do not want little specks of last week’s salmon on your cheese! -Smoke the cheese for 2 hours, turning it periodically, then taste it. Return to the grill or smoker for up to 2 more hours if you desire more smoke flavor. -Try to avoid handling the cheese when it first comes off the smoker as you can disturb the beautiful straw-colored patina created by the smoke particles. However, if the cheese has wept a significant amount of oil (some cheeses do), feel free to blot it with paper towels. -Wrap the finished cheese in uncoated butcher paper and label for short-term storage, or vacuum seal or tightly cover in plastic wrap. For best results, allow the cheese to “age” for up to two weeks so the smoke flavors can mellow out and penetrate the interior of the cheese.